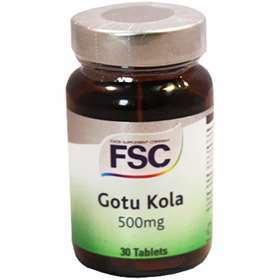 FSC Gotu Kola 500mg Tablets 30 displays properties that assist the healing of wounds and helps to improve the strength of the skin. It enhances the production of elements required to regenerate connective tissue, skin, hair, and nails along with improving mental agility and function by stimulating blood vessel growth. It is used for a comprehensive range of severe skin complaints including psoriasis, abscesses, syphilis, hepatitis, and gastric ulcers. Additionally it also helps with symptoms of rheumatism, mental fatigue, epilepsy, diarrhoea, fever, and asthma. A comprehensive supplement and a daily essential for the maintenance of healthy skin, mind and body. Promotes blood vessel growth within connective tissue. Accentuates antioxidant and collagen concentration in wounds. Aids the healing process in wounds. Conditions tissue, skin, hair, nails and joints. Enhances mental agility and function. Adults and children over 12 years of age; Take one to three tablets daily with food. Replace cap firmly after use and store in a cool dry place. Protect from light and heat. Keep supplements safely out of the sight and reach of children.